Hawaii has a number of agencies and partners dedicated to working on the complex issue of invasive species. Below are descriptions and links to various agencies, as well as a description of any relevant regulations or policies regarding invasive species that fall under the mandate each agency. The HISC was established for cabinet-level coordination and policy direction amongst the various agencies that deal with a portion of the invasive species problem. Chapter 194, Hawaii Revised Statutes, describes the duties and authorities assigned to HISC. In addition to policy advocacy and project coordination, HISC manages an interagency grants program to help fill gaps between existing agency programs and extend our current abilities through research and innovation. You can learn more about HISC here . The Hawaii Department of Agriculture (HDOA) regulates a number of activities related to pests. Below are a few key examples of HDOA policies that are relevant to pest species. For a full description of HDOA’s mandates, administrative rules, and programs, visit the HDOA website. The Hawaii Department of Agriculture’s Plant Quarantine Branch regulates the importation of goods into the State. Chapter 150A, Hawaii Revised Statutes (HRS), describes HDOA’s plant and non-domestic animal quarantine mandate. Hawaii Administrative Rules (HAR) Chapter 71 describes the process for importation and describing which species are conditionally approved, restricted, or prohibited from importation. For more information on importation, visit HDOA’s import program page. The HDOA also regulates the movement of agricultural pests within the State by restricting the movement of certain goods between islands and inspecting interisland shipments. The process by which HDOA regulates these shipments is described in Hawaii Administrative Rules Chapter 72. You can learn more by visiting the Plant Quarantine Branch’s page on their Interisland Inspection Program. The HDOA defines “noxious weeds” in Chapter 152, HRS as “any plant species which is, or which may be likely to become, injurious, harmful, or deleterious to the agricultural, horticultural, aquacultural, or livestock industry of the State and to forest and recreational areas and conservation districts of the State, as determined and designated by the department from time to time.” The criteria for designating noxious weeds and the list of species currently designated as such are available in Hawaii Administrative Rules Chapter 68. The HDOA Plant Pest Control Branch eradicates, contains, or controls pests of plants which could cause significant economic damage to agriculture, our environment, and quality of life. This branch of the HDOA includes the Biological Control Section, which researches and develops biological control agents to mitigate the impacts of certain pests. The Department of Land and Natural Resources (DLNR) regulates the transport of and release of wildlife, manages aquatic and terrestrial resources, and is the administrative home of the Hawaii Invasive Species Council. To see a full description of the department’s mandates, administrative rules, and programs, visit the DLNR website. Under statutory authorities provided by Chapter 183D, Hawaii Revised Statutes, DLNR’s Division of Forestry and Wildlife (DOFAW) maintains Hawaii Administrative Rules Chapter 124, which defines “injurious wildlife” as “any species or subspecies of animal except game birds and game mammals which is known to be harmful to agriculture, aquaculture, indigenous wildlife or plants, or constitute a nuisance or health hazard and is listed in the exhibit entitled “Exhibit 5, Chapter 13-124, List of Species of Injurious Wildlife in Hawaii…” Unless permitted by DLNR, it is prohibited to release, transport, or export injurious wildlife. Permits may be applied for per the instructions at DOFAW’s Injurious Wildlife page. Under statutory authority provided Chapter 187A-31, Hawaii Revised Statutes, DLNR’s Division of Aquatic Resources (DAR) is designated as the lead State agency for preventing the introduction and carrying out the destruction of alien aquatic organisms through the regulation of ballast water discharges and hull fouling organisms. The Department of Health regulates programs that impact human and environmental health. Though the Department’s Vector Control Branch was eliminated in 2009, the Department is still mandated to control vectors of human disease. Remaining Vector Control Workers are currently employed under the Department’s Sanitation Branch. You can learn more at the DOH webpage for Vector & Disease Control. Chapter 321-11, Hawaii Revised Statutes describes subjects of health under the Department’s purview, including the management of mosquito breeding habitat and the deinsectization of aircraft to prevent the introduction, transmission, or spread of disease or the introduction or spread of any insect or other vector of significance to health. The Department’s programs relating to vector control are further described in Hawaii Administrative Rules Chapter 26. The Plant and Environmental Protection Sciences department, focusing on invasive insect biology, biological control, and plant pathogens. Natural Resources and Environmental Management, focusing on wildlife management and invasive weed management. The Cooperative Extension Service, including researchers specializing in pests, diseases, and weeds. The Department of Botany, including researchers in invasion biology and species conservation. Big Island Invasive Species Committee. Highways Division, which has developed the Statewide Noxious Invasive Pest Program (SNIPP) to minimize invasive species concerns related to the maintenance and use of state highways. The SNIPP Strategic Plan describes the department’s goals for the period of 2012-2022. Airports Division: In addition to working with Hawaii Department of Agriculture on hosting facilities for agricultural pest inspection, the Airports Division is pursuing an interagency project under the HISC to enhance pest monitoring at airport facilities. 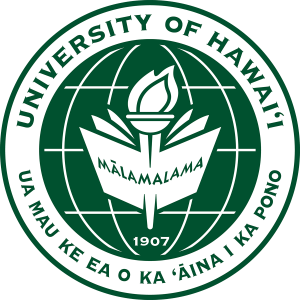 The goal for this future project, known as Māmalu Poepoe, is to coordinate efforts of UH researchers, Department of Health Vector Control workers and entomologists, Department of Agriculture entomologists, and Department of Land and Natural Resources biologists to develop a pilot program that examines pest presence and creates a model for enhanced pest surveillance. Office of Planning, which administers the Coastal Zone Management Program (CZM), Ocean Resources Management Plan (ORMP): CZM is tasked with coordination of the ORMP: an interagency effort to effectively manage and protect marine resources. Office of Planning also hosts the State’s GIS program, an important resource for mapping and planning invasive species projects. Hawaii Tourism Authority (HTA): DBEDT is the administrative host of the HTA. A report to the HTA from the University of Hawaii Center for Sustainable Coastal Tourism estimates that the 2010 market valuation for Hawaii’s natural resources, tourism infrastructure and facilities, and tourism related businesses was approximately $8.24B. The report identifies invasive species as a primary threat to natural resources that support Hawaii’s tourism industry (Cristini et al., 2012).